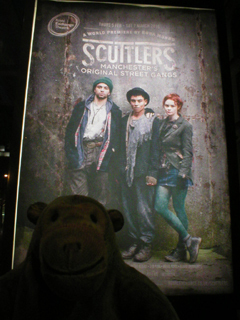 Mr Monkey took the bus into Manchester and scurried along to the Royal Exchange Theatre for the press night of Scuttlers. 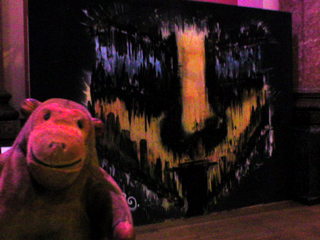 Before watching the play, Mr Monkey examined a number of large street art panels along one wall of the theatre building. These were painted by a group of graffiti artists based in Manchester. Mr Monkey also noticed that the glass walls of the theatre pod had been covered with a combination of graffiti name tags and designs based on nineteenth century gang symbols scrawled in chalk. In the late nineteenth century, parts of Manchester were home to gangs of young people known collectively as scuttlers. Most were employed in the cotton mills, and each gang seemingly existed solely to defend its territory against encroachment by its neighbours. The largest of these gangs was the Bengal Street Tigers of Bengal Street in Ancoats. Their fights with the gang centred on nearby Prussia Street could involve hundreds of scuttlers. 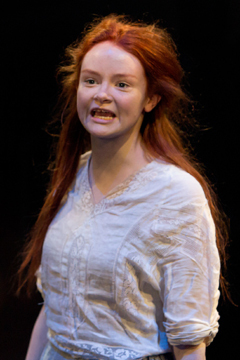 Rona Munro's new play Scuttlers centres on the conflict between the scuttlers of Bengal Street and of Prussia Street. It's a hot summer in a grimy city and the festering conflict over the ownership of Jersey Street and a bridge over an arm of the Rochdale Canal could come to a head at any moment; the only thing holding violence off is that the mills are all working full time. There are, of course, complications. The leadership of the Bengal Street Tigers is disputed. A soldier whose regiment has recently returned to Manchester has relations in both Bengal and Prussia Streets. A young lad from Chorlton way has started to follow the Tigers around, eager to make a name for himself. Everything is ready for a thoroughly unpleasant ending for most of the cast. The set is empty for most of the play, as it's either being a street, a bridge or a large room. There is a marvelous construction dangling over the stage at the start, a circle supported by cotton thread representing the machinery of cotton mills. This reappears, repurposed, near the end of the play. The production has excellently atmospheric industrial music throughout, composed and performed by Denis Jones. The basic plot is reminiscent of West Side Story, only without any singing. Mr Monkey couldn't really find much evidence of the connection between the scuttlers and the riots of 2011 that Rona Munro claimed inspired the play, but that didn't really matter. Mr Monkey really wanted to know what happened, and who'd be left standing at the end. The cast throw themselves into the action with gusto, quite literally in the well choreographed and executed fight scenes. As Mr Monkey expects from the Exchange the cast were all good, and he was impressed by the way that the production made both gangs appear bigger than the number of actors available. Mr Monkey found Scuttlers a thought provoking piece, raising questions about gender roles, family relations, and the individual's need to belong to a group. Mr Monkey enjoyed Scuttlers, despite a somewhat predictable plot, the robust language and quite unsettling violence. When he got home, Mr Monkey tried to find out where Bengal Street and Prussia Street are. Bengal Street was fairly easy to find, as was Jersey Street but he had to go to Historical Maps of Manchester website and study the maps from before the First World War to find Prussia Street. Sometime between 1908 and 1920 - probably during the war - Prussia Street was renamed Kemp Street, and it's now a bit shorter and called Wadeford Close. 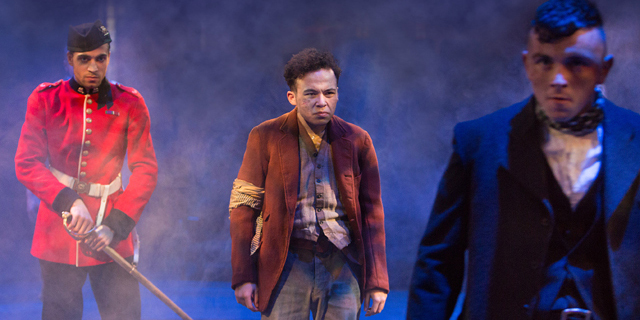 Scuttlers runs until 7th March 2015.